Stripped bare of your colours. Who am I? Sien Hoornik…….. Vincent Van Gogh met her, the mother of a 5 year old girl in 1882. She was also pregnant at the time; and a prostitute;, and suffering from venereal disease. 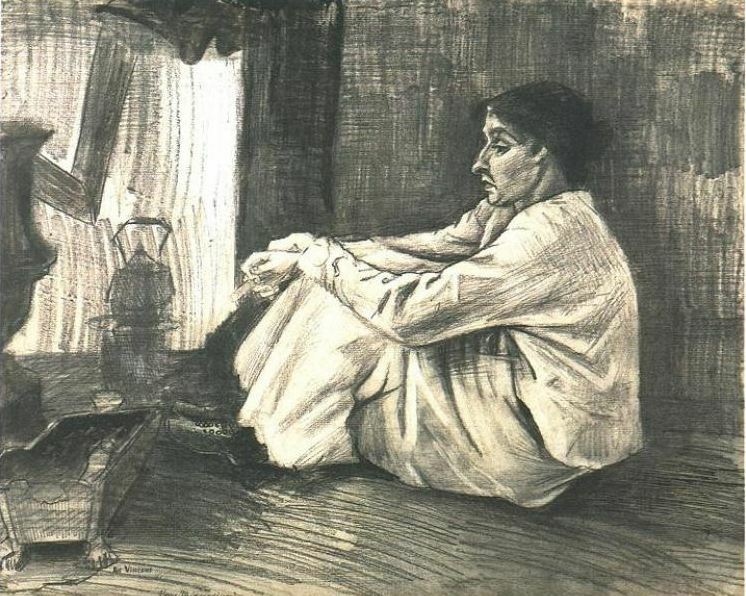 She posed for a number of drawings and paintings for him reflecting the difficult life of the working poor in domestic roles such as mother, seamstress and domestic worker. Van Gogh took her into his home and wrote about his love and affection for her in his letters to his brother. When the baby was born he was named Willem after the artist. Van Gogh wanted to marry Sien but was pressured by his father and then his brother to abandon them all . By the end of 1883 he did leave them, for Drenthe. Van Gogh died in 1890. Sien eventually married Anton van Wijk in 1901. She drowned herself 4 years later; 14 years after Van Gogh’s death. The life of the artist is so much a reflection of the life of each one of us. I have studied Van Gogh a bit, actually quite a bit.Practically every brushstroke. His letters showed how much he thought of her. She was a bit hard going for him but there was genuine affection. There is a bit of a question that the baby was probably his.His health took a dip after her. Thank you for this….so much food for thought. Thank you Janet and yes! Sad stories. I once visited Arles looking for Van Gogh. The yellow house has gone of course! So you found him Andrew! …..Heh! I really think you may have been a bit disappointed with the real building a day after he painted it anyway so it didn’t matter about the yellow house! He made the asylum look pretty damned good as a colour study.And that was hell.Thank goodness we only ever have to deal with VG’s interpretation as a piece of art as he saw it (felt it and so on) at the time (day)he was there and painted it. It was never chocolate box for him! No pretty birds ever (flowers maybe) He just saw light. I believe that the only thing with art is to appreciate the art object with no other reference to any other thing, and just let it hold you (or not)…. then if you are lucky you’ll discover the language of art that has no words but suggests the painter’s journey. The trouble with colour (and colour is everything with VG) over time, it only ever leaves a vague impression of the painting process. And Colour photography of art is merely a guide. Photographers taking photos of masterpieces are left to make what they can of the living final brush strokes. It is an impossible task and quite a responsibility; sometimes the finished artwork (or original subject) will look better than it does and sometimes worse that it really is. The only thing is the real thing and the real thing is the art!!!! So ……the building wasn’t there!….. but you were there under the same sky! Lucky you!!! The same light was there that falls every day on everything there sitting in that place; especially the purple shadows on anything yellow if you look hard enough especially on the edge of things in clear sun ( a bit harder to find in the UK!)….. You were there in the place where he walked…..with his footprints still on the ground never entirely gone away (same as that building)….all still there to trace and feel something… just as the artist would do today (if alive) however much it has changed. But you didn’t have to do that……and you know that! ….. His genius was to make you like what he saw, the way he saw it (his vision) on that bit of canvas. When you were there you were merely in the middle of what he made of the place, the bit before the drawing, a line or two before the paint. You only have to like his brush strokes… which you clearly do!!! I am not an art expert but I do like Van Gogh. I went to the museum/gallery in Amsterdam and was disappointed because a lot of his work was out on loan! I wanted to visit Arles more from a historical rather than an artistic perspective, I wanted to visit the place where he lived and worked. Van Gogh wouldn’t recognise it now of course. The Yellow house was destroyed in an Allied bombing raid in 1944 and there has been huge redevelopment around the Roman Amphitheatre with massive demolition and clearance of old houses. The streets are still there of course and a café which claims to be the setting of ‘Café Terrace at Night’ (one of my favourites) so it is possible to say that I walked in his footsteps. I was interested in the famous light as well and I do recall it being very clear and vibrant. It is terrible how things have disappeared under bombs but it sounds as if the place has changed beyond recognition with more damage to the place than wartime ever did and what a disappointment to arrive and find his work out on loan. It would be great to get spirited back for a moment or two and see things as they were. Sounds very hard to find him quite there! I may have managed more than you then. In Oxford you can walk right up to at least one of his paintings and touch it, honestly [still free entry at the Ashmoleon Museum] at least till very recently you could. I used to go regularly to look at this one as a kid with my big sister, and was not at all impressed just then! It might be under armed guard by now. Surprisingly the one in Oxford shows a lot of rough tatty beige un-primed canvas…… dabbed with yellow paint; and is surprisingly dull! I grew to love it in time and I have always looked for the loose canvas on great works as a result of seeing that one which comes from Asnieres* . Glad you saw some light that one time! By the way there wasn’t even a window in the room where the VG was back then…. when I licked the painting!! Michael Portillo was in Arles last night on TV – Great Continental railway Journeys. There is a few minutes about Van Gogh so it is worth trying to find it on catch-up!